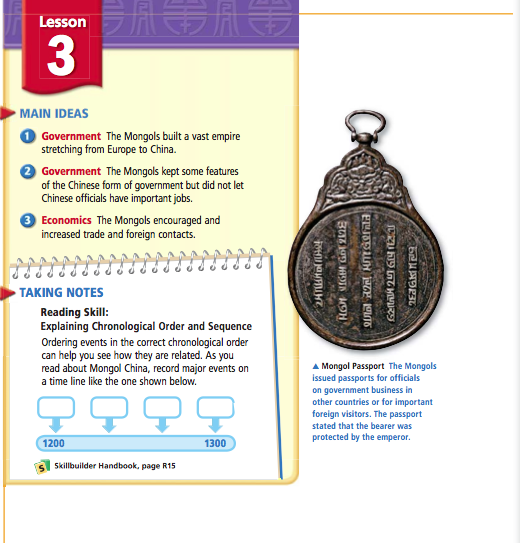 Lesson 3 traces the Mongol conquest of much of Asia. 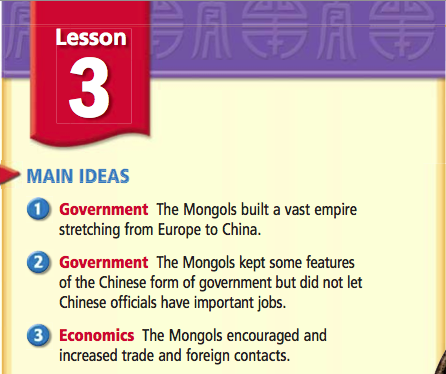 Build on What You Know As you read in Lesson 1, nomads from the north invaded China when the Han Dynasty fell. In the 1200s, outsiders once again invaded China. 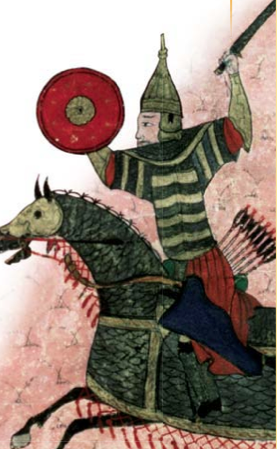 This time, the invaders were the Mongols. How did the Mongols build a vast empire that stretched from Europe to China? The Mongols were fierce nomadic warriors who lived in the vast plains to the northwest of China. In the 1200s, they invaded and conquered China. A Great Leader The Mongols lived in independent family groups called clans. These clans were joined together into several tribes, which were independent of each other. But around 1206 a strong leader named Temujin (TEHM•yuh•juhn) united the Mongol tribes. He fought and defeated all his rivals for leadership one by one. By doing so he became the khan, or ruler, of all the Mongols. He took the name Genghis Khan (JEHNG•gihs KAHN), which means “universal ruler.” Genghis organized the Mongol warriors into a mighty fighting force and began a campaign of conquest. He invaded northern China, then moved west across Central Asia. Throughout history, nomadic people often had a military advantage against settled people. Settled people tried to defend their cities and towns. Nomads, however, moved quickly, looked for weak spots, attacked, and moved on. This helped them succeed at war. 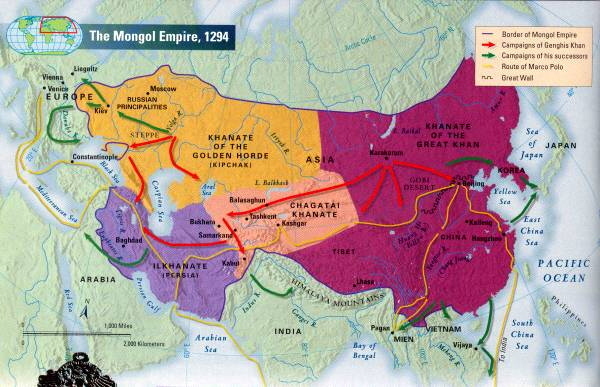 By 1221, the Mongols had conquered all of Central Asia. The Mongols lived in independent family groups called . The Mongol Empire When Genghis died in 1227, his son, Ogadai (OH•goh•DAY), took power. Ogadai captured the rest of northern China. He also extended Mongol rule as far west as Russia and Persia. The Mongol Empire was divided into four large parts called khanates. A different descendant of Genghis ruled each part. 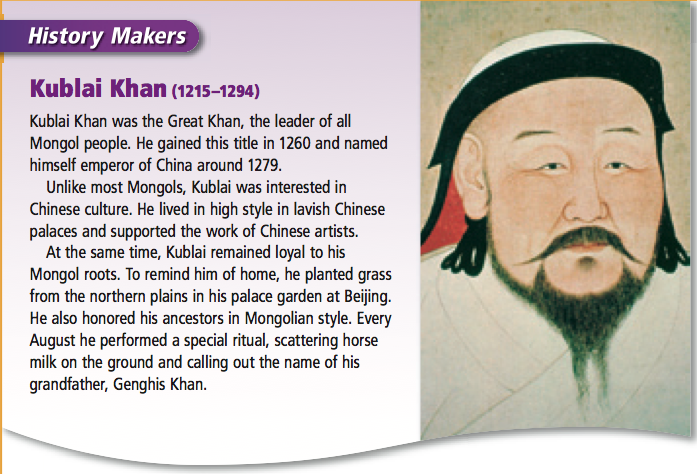 Kublai Khan (KOO KOO•bly KAHN), Genghis’s grandson, took power in the Chinese part of the empire in 1260. At that time, southern China was still under Song control. Kublai’s forces finally defeated the Song in 1279. The Mongols now controlled all of China and would rule until 1368. The Mongol Empire was divided into four large parts called . More About . 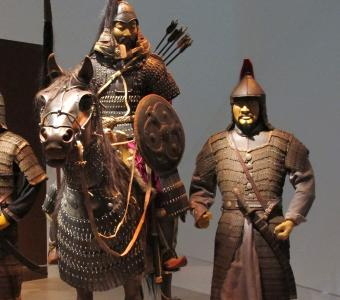 . . Mongol Warriors Each Mongol warrior had standard equipment: a sword, a lasso, a short bow to use on horseback, a long bow for use on the ground, and an ample supply of arrows. Most warriors wore breastplates and helmets for armor. Each rider had several ponies. 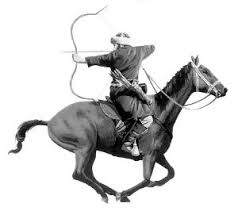 Besides having great skill as horsemen and archers, the Mongols were very adaptable fighters. They adopted Chinese technologies, such as gunpowder, to lay siege to Chinese cities. Kublai Khan was the first ruler in 300 years to control all of China. The Mongols were also the first foreign power to rule China. 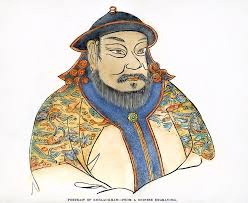 Kublai ruled China for 15 years and died in 1294. Learning to Rule The Mongols did not have much experience with government. The Chinese, on the other hand, had a long history of organized government. So Kublai kept many aspects of Chinese rule. He built his capital at Beijing in traditional Chinese style and declared himself emperor. He also founded a new dynasty—the Yuan (YOO YOO•ahn) Dynasty. These steps were familiar to the Chinese and made it easier for Kublai to control China. Maintaining Control Kublai kept features of the Chinese form of government, but he made sure that the Chinese politicians didn’t gain too much power. He did this to keep control of China in Mongol hands. He ended the civil-service examination system for choosing officials. Instead, he gave the important government jobs to Mongols or to trusted foreigners. Chinese officials were given only minor jobs with little or no power. Even so, the influence of Confucian thought remained strong during Mongol rule. Mongol officials adopted Confucian approaches to government. In addition, Kublai appointed Confucian scholars to educate the sons of the Mongol nobility. 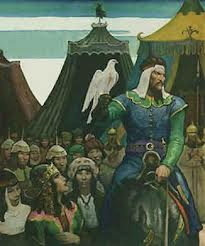 Despite differences with the Chinese, Kublai Khan was a capable leader. He worked to rebuild China after years of warfare. 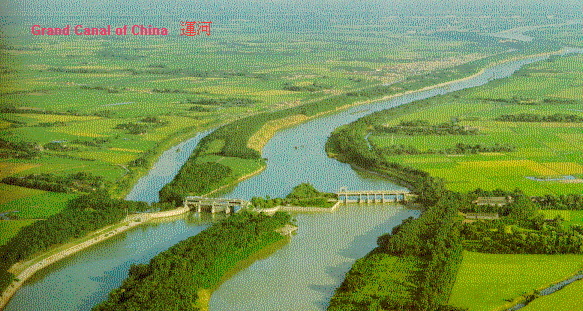 He restored the Grand Canal and extended it 135 miles north to Beijing. And he built a paved highway that connected Bejing and Hangzhou. These land and water routes allowed for easy travel between north and south. He also made changes that helped promote trade and contacts with the rest of the world. was the first ruler in 300 years to control all of China. What features of the Chinese form of government did the Mongols adopt? structured government and the Confucian approach to government. How did the Mongols maintain control of China? Gave important government positions to Mongols or trusted ; Chinese ofﬁcials were given only minor positions with little or no power. How did the Mongols encourage trade? During Kublai Khan’s rule, China became more open to the outside world. The Mongols developed a thriving sea trade and welcomed visitors from foreign lands. 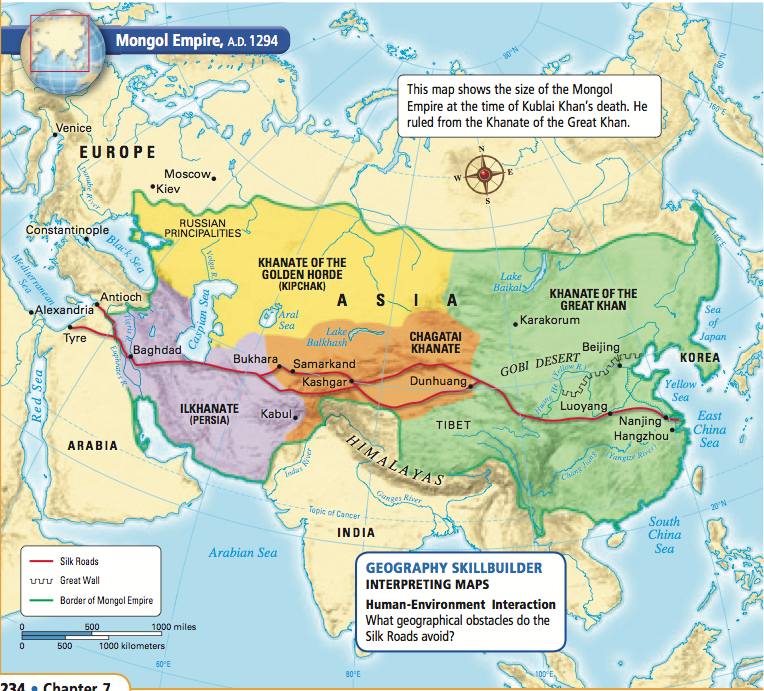 Trade Routes One way that the Mongols encouraged trade was by making trade routes safer. In the past, China sometimes closed overland trade routes because of warfare and banditry. Now, the Mongols controlled all of Central Asia. This period of Mongol control is known as the Mongol Ascendancy. 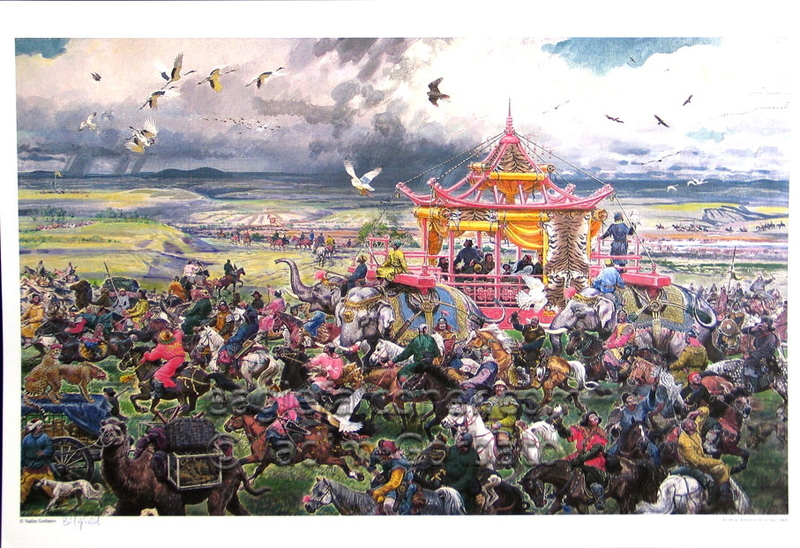 Mongol control made overland travel safe. Caravans moved along the Silk Roads, ancient trade routes stretching from China to the Black Sea. (See the map on page 234.) 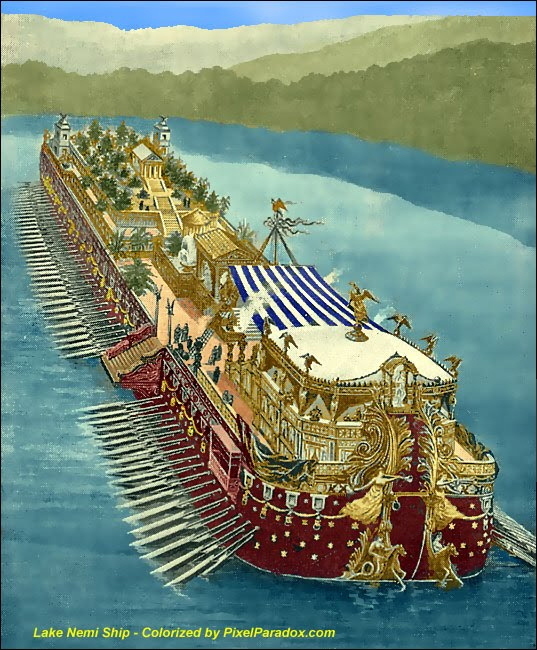 Merchants took silks, porcelain, tea, and other goods to western Asia and Europe. The merchants brought back new foods, plants, and minerals. 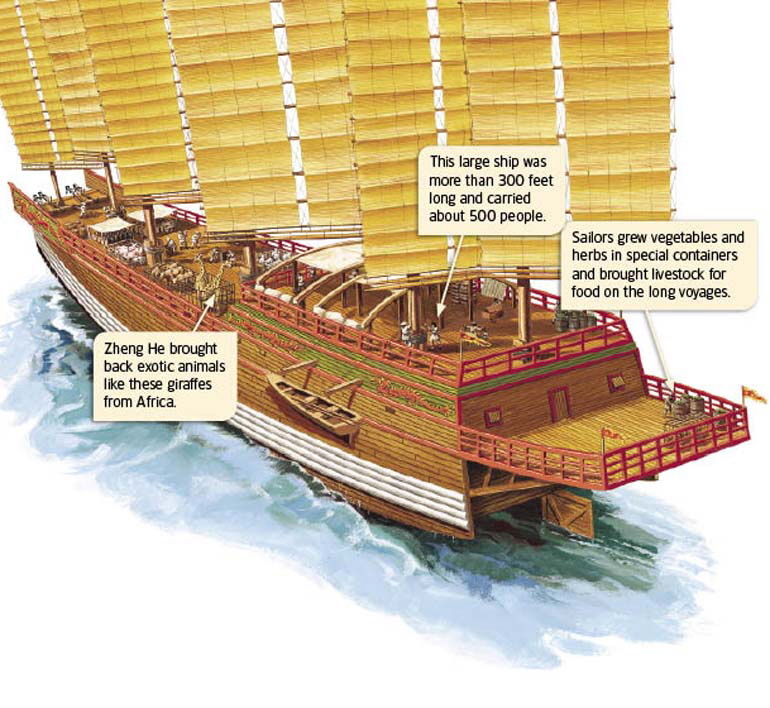 The Mongols also encouraged sea trade. Ships crossed the Indian Ocean and South China Sea to reach Chinese ports such as Guangzhou (gwahng•joh) and Fuzhou (foo•joh). There, merchants did a lively trade in goods from both East and West. Unlike most Mongols, Kublai was interested in culture. Foreign Contacts Trade brought increased contact with foreign peoples and cultures. People from Arabia, Persia, and India frequently visited Mongol China. Even missionaries and diplomats from as far away as Europe made the long trip. These visitors helped tell the rest of the world about Chinese civilization. 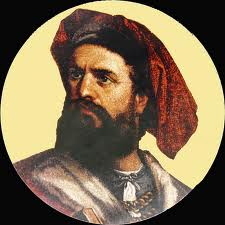 The most famous European visitor during this period was Marco Polo. Polo was a young trader from Venice, Italy. 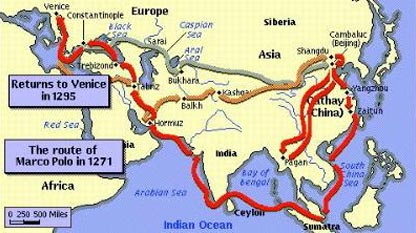 Marco Polo traveled the Silk Roads to China with his father and uncle. He arrived around 1275 and stayed for 17 years. 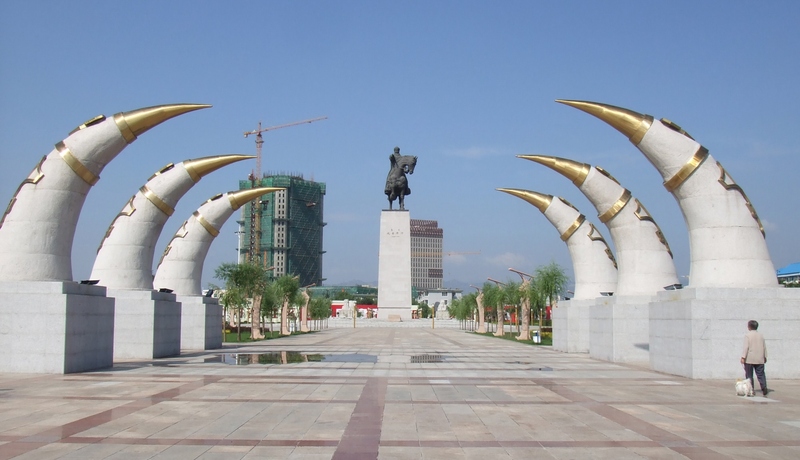 Polo became an assistant to Kublai Khan and traveled throughout China on government missions. He later published a book about his adventures. Polo’s book was a great success, but many Europeans found his vivid descriptions of China hard to believe. In the next lesson you will learn how the Chinese overthrew the Mongols. More About . . . Social Classes in China Under Kublai Khan and his followers, the population was divided into four groups. The Mongols were the highest level of society. They paid no taxes and were given lands and peasants to work them. 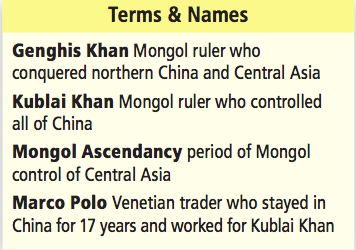 Foreigners who worked for the Mongols were the second-highest level. They, too, were free from taxation. The northern and southern Chinese made up the two lowest social groups. Many in the north were taken off their farms and sent to work on the construction of Kublai’s new capital. Others labored on improvements to the Grand Canal. These policies caused resentment of the Mongol rulers that eventually led to their downfall. Mongols were the level of society. They paid no taxes and were given lands and peasants to work them. More About . . . The Silk Roads Because Silk Road caravans were at the mercy of robbers and political disputes, trade increased during times of peace and stability. Commerce thrived under the Tang and Yuan—both dynasties that were open to outsiders and could maintain safety. As the Mongol Empire broke up, trade conditions worsened. became an assistant to Kublai Khan and traveled throughout China on government missions. • The Mongols built an enormous empire stretching from China to Europe. • The Mongols adopted some features of the Chinese style of government. • The Mongols increased foreign trade, especially along the Silk Roads to Western markets. Why It Matters Now . . . The contacts between Mongol China and the Arab and Western worlds spread important ideas and trade goods. Because of this, many Chinese inventions can be found worldwide today.